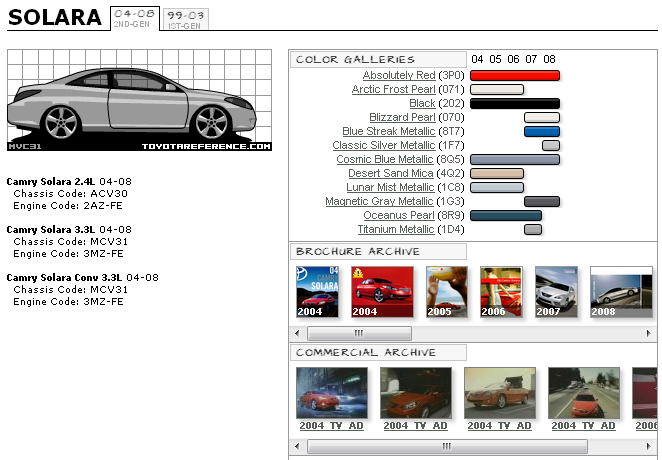 Here is the chart of color for the US-Spec Solara from 2004-. If you see an error please post it here and I will correct the page and graphic ASAP. You can upload a photo of your car by clicking on the graphic, then clicking on the appropriate camera icon next to your color. If you need me to update the chart please post your model year (or production date), color code and a description or photo of your car. For now this is for US-Spec cars only, I will add other countries in the future. Last edited by scionlife on Tue Sep 02, 2008 1:45 am, edited 2 times in total. How about some photos, guys! I've added mine to the 3P0 photos. Thanks, saw your Solara upped to the site. Very clean! Added information that just came in from the 2007 Toyota USA Fleet site. Arctic Frost Pearl, Desert Sand Mica, Lunar Mist Metallic and Oceanus Pearl are all dropped. New colors are Blizzard Pearl, Magnetic Gray and Titanium Metallic -- all 2007 Camry colors. Well, Toyota made some changes to the Fleet spreadsheet... Oceanus Pearl is back on the list for 2007.
scionlife wrote: Well, Toyota made some changes to the Fleet spreadsheet... Oceanus Pearl is back on the list for 2007. You're missing the great new bright blue color-Blue Streak Metallic. Wow, the fleet guys REALLY need to communicate with the retail Toyota guys... the document that I got listing colors for 2007 came from fleet.toyota.com and it STILL doesn't list Blue Streak Mica for the 2007 Solara, just the 2007 Tundra! I have added it to the chart now. Anyone have any information on the 2009 Solara yet? Colors? Specs? Existence!?! Toyota has announced that the Solara convertible will continue through 2009, but there won't even be a printed brochure! Classic Silver Metallic is available for 04's. Or is my car a rarity...?